Trigun is a classic anime and in the Space Western genre. Trigun is about Vash the Stampede and two Bernardelli Insurance Society employees, Meryl and Milly, who follow him around in order to minimize the damages inevitably caused by his appearance. Most of these damages however are caused by bounty hunters who are pursuing the sixty billion double dollars bounty which is on Vash's head for the destruction of the city of July, which he cannot remember too clearly. As the series progresses Vash's mysterious history is uncovered as well as that of the human civilization on the planet Gunsmoke. 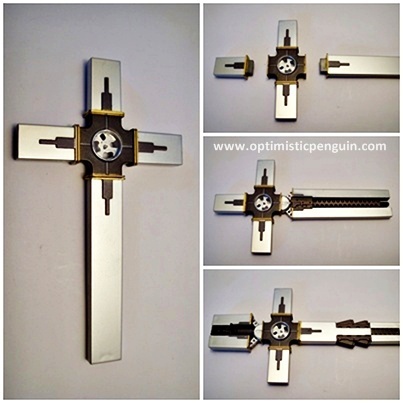 Wolfwood is a superb gunman, almost equal to Vash, he is a priest and a member of the Eye of Michael who wields a cross-shaped gun called the Punisher. In the manga he grows up in an orphanage before being taken in and trained by Chapel, he then joins the Gung-Ho-Guns at one point before working for Knives. In the anime however he is raised by an abusive guardian before being taken in by Chapel and therefore runs an orphanage for other mistreated children, and throughout the anime he makes reference to his children. In the series Wolfwood eventually teams up with Vash and they have many conflicts about morality, Wolfwood believing that killing is inevitable and Vash believing that you do not need to kill, and by the end of the series both characters learn from each other. Although at the end of series Wolfwood is redeemed for the sins he carries if only a little to late, in the manga he dies after a fight by overdosing accidentally on his regenerative vials and in the anime he is shot as he shows mercy towards his old master. 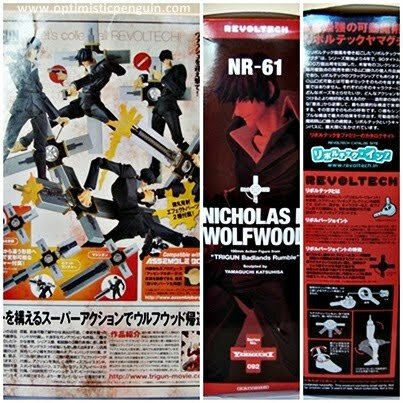 Nicholas D Wolfwood comes in a standard Revoltech Yamaguchi box. 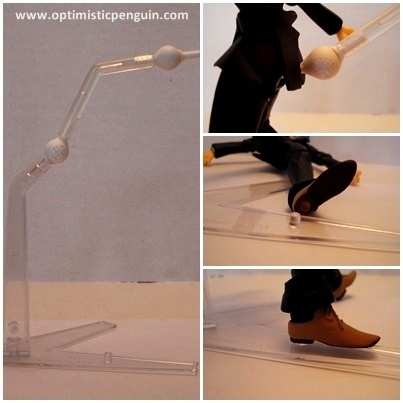 Wolfwood comes with the standard Revoltech Yamaguchi stand. Made of clear plastic it has two points of articulation, two Revoltech joints which allow movement forwards and back and turning. The main piece of the stand plugs onto the V-shaped base, a Revoltech joint is then attached to the end, a bent pole is then attached to the other end, and another Revoltech joint to the end of this. The articulation of the stand allows the Revoltech to be posed in a variety of dynamic poses, and to gain some nice hight for jumping poses, it is overall a very well designed stand. Wolfwood's overall design is sleek he is wearing a suit with some nice pointy shoes with a big exaggerated collar of a shirt. 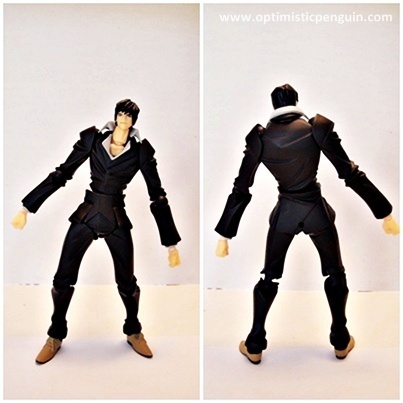 Although Wolfwood does not have the most interesting design as far as clothing goes Revoltech have put a lot of folds and ripples in his suit to give him a bit more character, you get the feeling he is a priest on the move and not a man in an office, hence his suit is a bit wrinkled in places. This is version of Wolfwood is of him in his outfit that appears in the new Badlands Rumble movie and so has some variation on his original anime costume. Starting from the top, he has straight somewhat spiky hair, and I think they have captured the characters face rather well, as he looks rather like his anime and manga counter part. His clothing is all molded and hard plastic, with folds and ripples in the suit disguising joints reasonably well nothing much really to say as he is just wearing a standard suit. Really nothing much to say simple straight forward sculpt and true to his character design. Wolfwood has a colour scheme of, navy blue and grey. He is basically wearing a navy blue suit with a greyish blue undershirt, and he has some brown shoes. Sadly unlike Vash he has no shading on his clothes what so ever, but perhaps with is because you don't get much shading in the ripples and folds of navy blue suits, who knows, so nothing really to say about that, his facial expressions are all painted well and his shoe laces are painted neatly. Wolfwood's accessories are very well painted, the detail on his two hand guns is done nicely and the paint work on the cigarettes is great they even have a little bit of red on the end, very realistic and convincing. The Punisher is nicely painted with chrome paints. His effects pieces are painted particularly well, made of semi-clear plastic the effects base has some nice paint spray on it giving it some texture, and the machine gun fire affect has lovely shading of yellow and orange, as does the rocket effect piece. 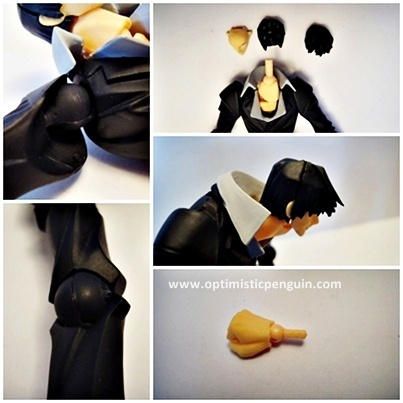 Wolfwood use’s the standard Revoltech Yamaguchi joint system. 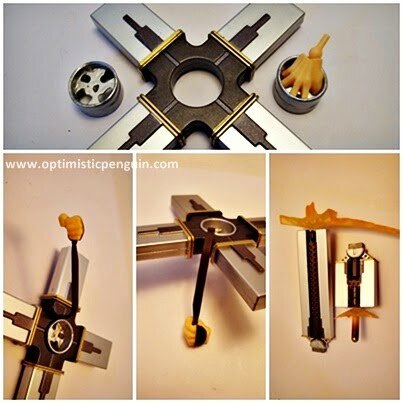 Revoltech joints are hinge joints with pegs on either end allowing both forward and back movement and rotation. At the head a Revoltech joint is used at the bottom of the neck allowing the figure to look up and down and then a smaller Revoltech joint is used at the top of the head to allow their head left and right and look up and down more. 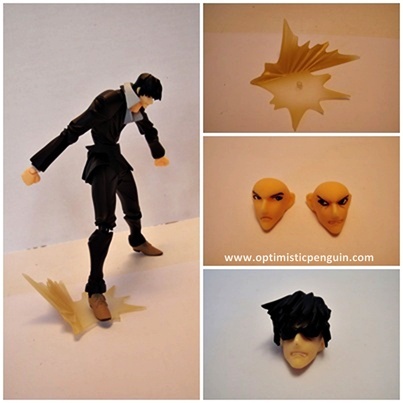 To change the faces on Revoltech Yamaguchi figures the head is removed from the neck and the fringe is removed and the facial expression is pulled apart from the back of the head and new facial expression is plugged on. Wolfwood also has additional articulation in his neck, allowing his neck to slide further forward putting him is a hunched position. 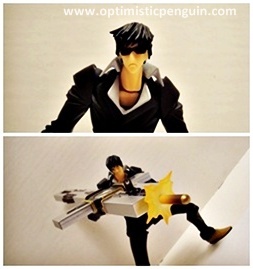 Wolfwood is therefore highly posable and can be posed in a variety of ways. With the use of the accessories supplied, his Punisher and it varies forms and his cigarettes, he can be displayed in a number of poses, chilling out and smoking a cigarette, firing his rocket launcher mode, using his machine gun mode, or fighting with two hand guns, or just looking cool with his shades. However there are a few areas in which articulation is restricted, due to the back of his coat his leg cannot move back. Wolfwood comes with three facial expressions; a smiling expression, a concerned looking to one side expression, and a crazy angry expression. 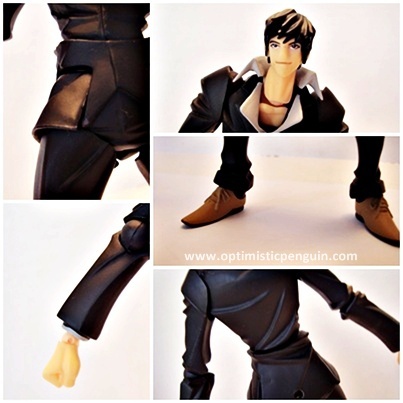 Wolfwood also comes with an assortment of hands; a pair of fists, a pair of open hands, a hand for holding his leather strap, a hand attached to a piece of his gun for holding his gun, a pair of hands holding hand guns, a hand for holding his cigarette, and two hands for holding weapons. 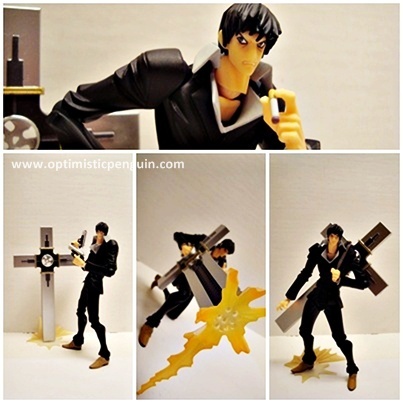 Wolfwood also comes with his Punisher and three of its forms, the normal unarmed form, the machine gun form and the rocket launcher mode, to change each of the modes simply unplug the applicable end of the cross and plug the new mode on. 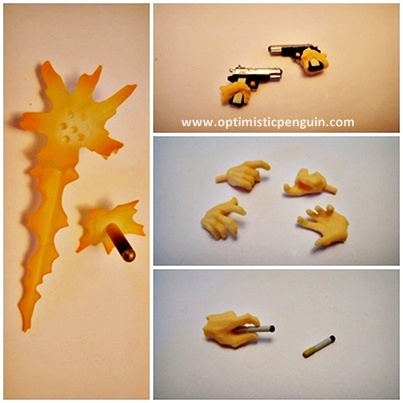 Also to use the hand which is holding a part of the gun simply slide the regular circular piece out of the middle of the Punisher and slide in the one which has a hand attached. Wolfwood also comes with a leather strap which can attach to the Punisher in two ways, so that he can sling it over his back or drag it along the ground, to attach simply choose either the peg sticking straight out or underneath the strap piece and plug it into the small hole on the Punisher, next to the circular piece, and then peg the other end of the strap into either the hole on the top or bottom of the strap holding hand. One cannot forget either his two cigarettes which look very convincing and can be placed in a number of ways in what ever hand you like, he also has an extra fringe piece with his signature shades attached, so what ever the facial expression he can wear it with or without shades. And last but not least he has two effects pieces, one of machine gun fire and one of a rocket, which peg into the ends of his gun barrels. As mentioned before he also comes with an effects base which is a semi-clear brown plastic. 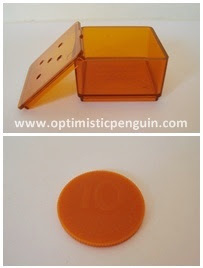 He also comes with an orange box for storing his accessories and a special coin as mentioned before. Also an added feature is that the Punisher has a small hole in the bottom so it can plug into his stand. 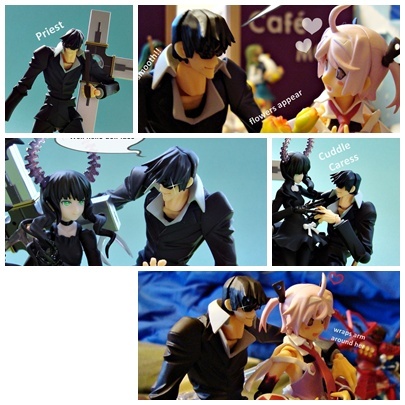 Revoltech Yamaguchi figures are generally compatible with each other, and Wolfwood specifically comes with holding hands so that he can use the weapons of other Yamaguchi figures, and is compatible with the Revoltech Assemble Borgs, also using his holding hands he can hold most Figma and Revoltech Queen's Blade items. Next up is a height comparison, as you can see he is about a heads taller than the Sengoku Basara Revoltech's and so is a bit taller than the Figma and Queens Blade Revoltech girls, and so he fits in well with their scale and is nicely scaled in character height with Revoltech Vash. In general Wolfwood is a fun figure. He comes with loads of accessories and has good articulation. He will fit in well next to Vash and also I am sure will be lady killer and steal attention away from Date and Sanada when he puts on his shades.